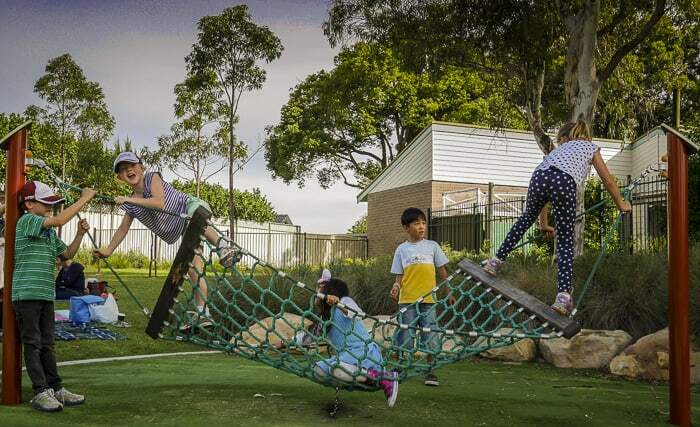 Seriously, this is one of the best playgrounds in the whole of Sydney. Don’t take my word for it, just pack up the car, fling in the kids and get over there. 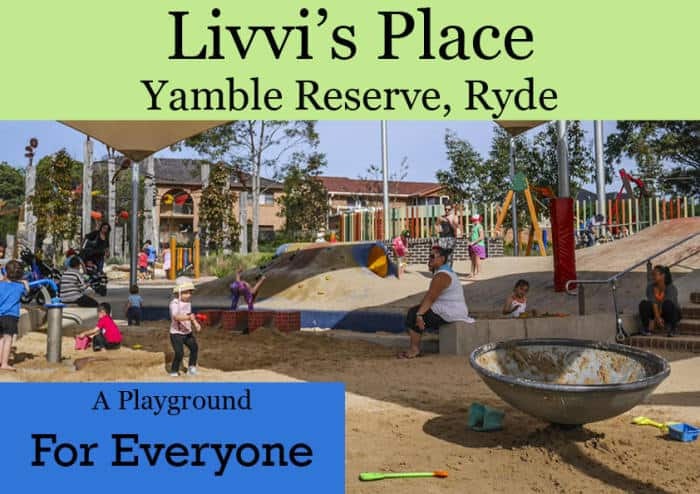 Yamble Reserve is a huge park, with vast areas of smooth lawns and within it is this enormous and very beautiful playground. Built in 2013, this is one of the Livvi’s Place playgrounds, built as a joint project between Ryde Council and the Touched By Olivia Foundation. 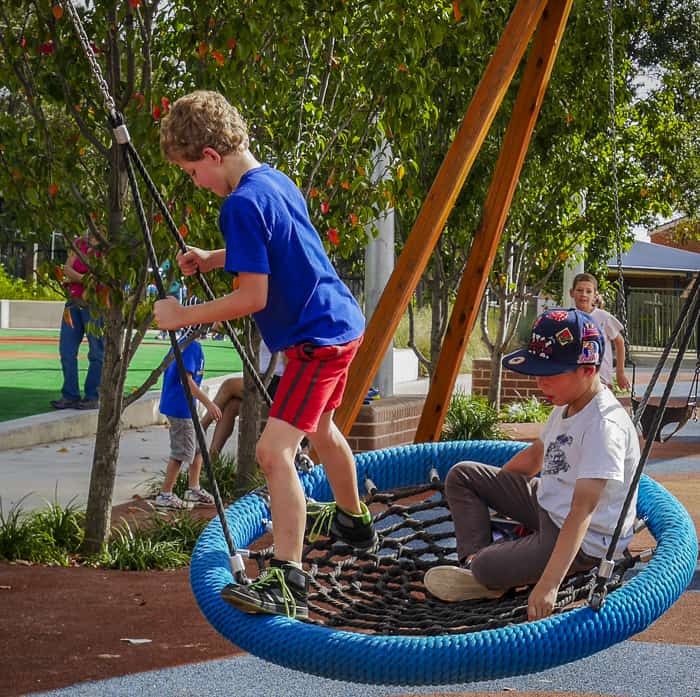 It is an inclusive playspace meaning that is is aimed at ALL members of the community, young and old, of all abilities and with all and any needs. The range of play equipment in this playground are dizzying. 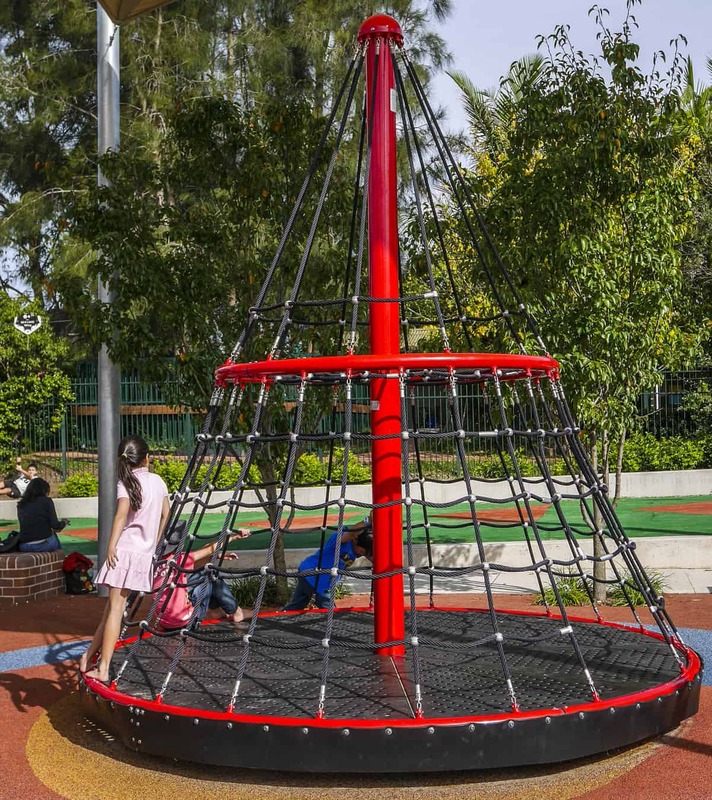 There is a very long double flying fox, one of the seats has a full harness, a large rope pyramid roundabout and a lower roundabout too. 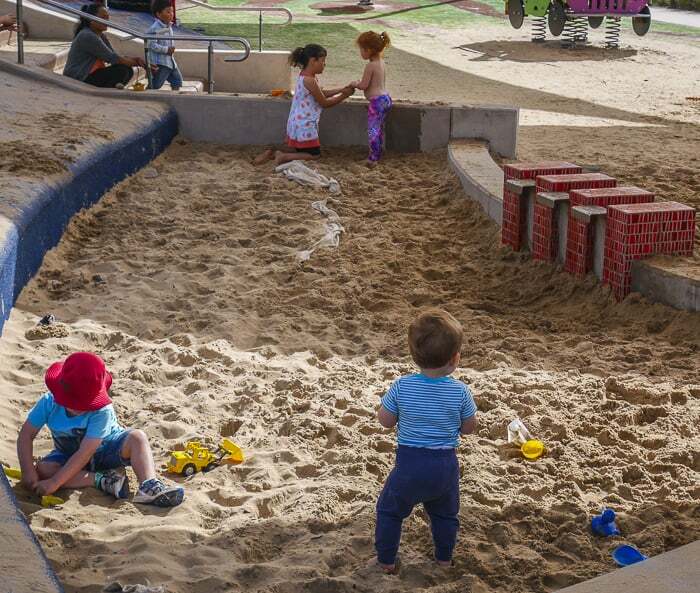 There is a large sandpit, a birds nest swing, a spinning dish, a musical play area and a car to climb all over! There’s a tunnel to play in and a large area covered with rubber softfall with handholds, excellent for people with mobility issues. 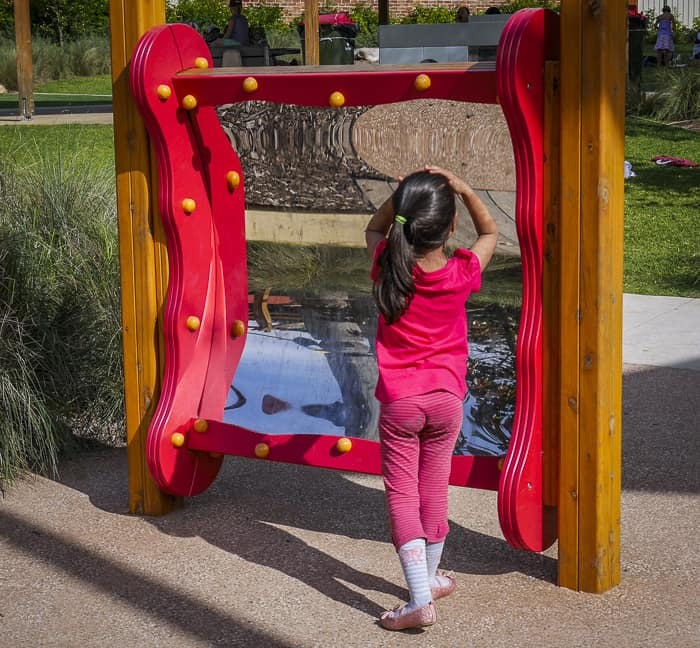 Themed play zones offer both stimulating and calming experiences. 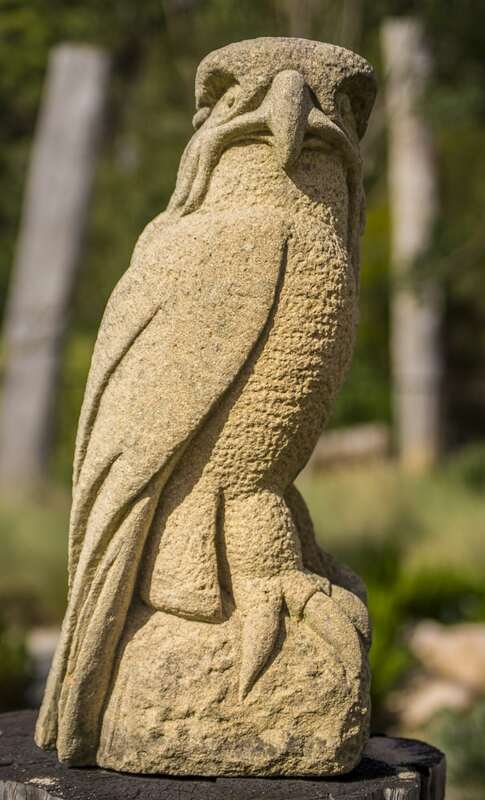 At the quieter area of the playground is a very beautiful series of pole artworks and the most gorgeous animal sculptures. 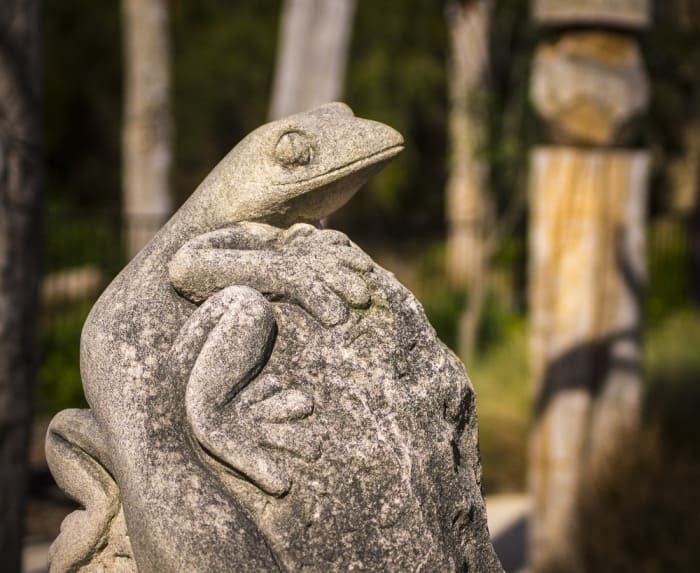 Here and throughout the park there are wonderful opportunities for tactile exploration. 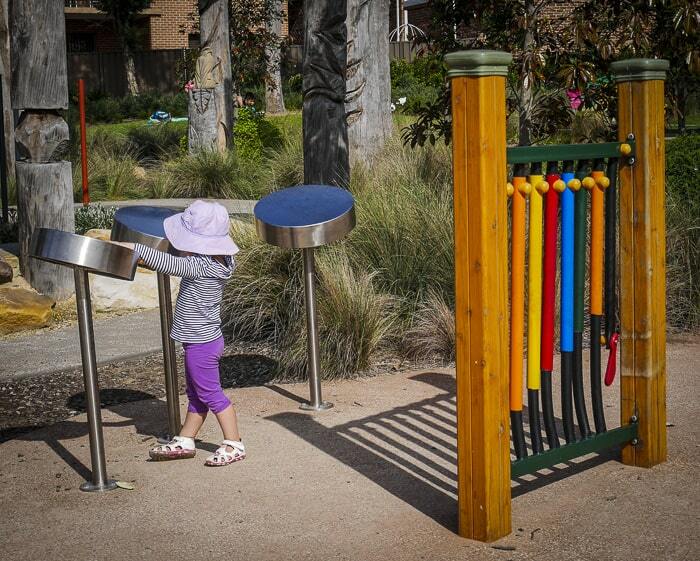 Within the playground are bubblers, lots of picnic tables, BBQs. 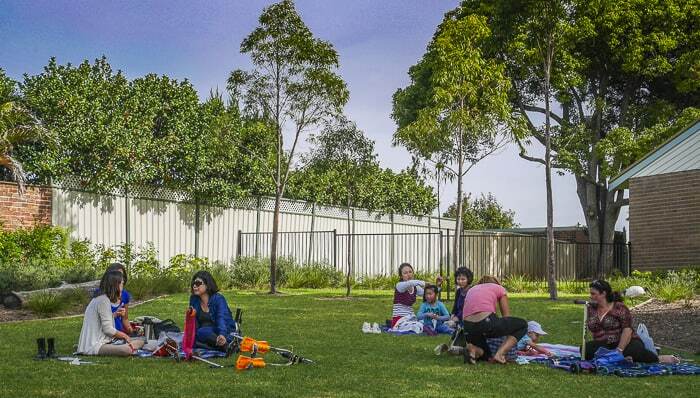 Toilets: Toilet block is just outside the playground, with both child and adult change tables. Shade: Yes, plenty from trees and shade cloths however these can be busy in high summer and much of the playground is still in full sun. Mum’s report: A very special playground in a very central location, great meeting spots for friends who live all over the city. Check out the Touched By Olivia website here. Have you visited this most excellent playground? Did I go overboard with the photos?? 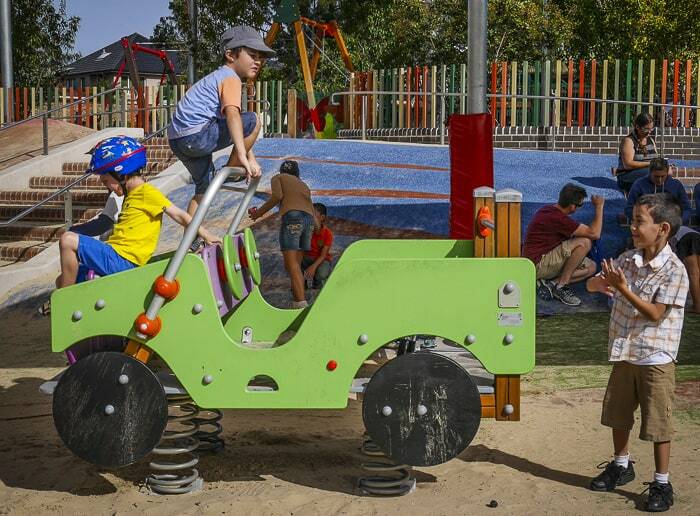 Livv’s place playgrounds are great for the older kids but not so great for toddlers. Only because there is no place to stand where you can see the whole playground all at once. The playground is built on a hill and there seem to be walls dividing the playground which shield certain parts from view. It means you have to hover over your toddler if you want to make sure they’re safe. The one at Five Dock is even worse as it has a motorised merry go round. I’ve seen a number of toddlers knocked over when they’ve tried to get on it while it is moving. 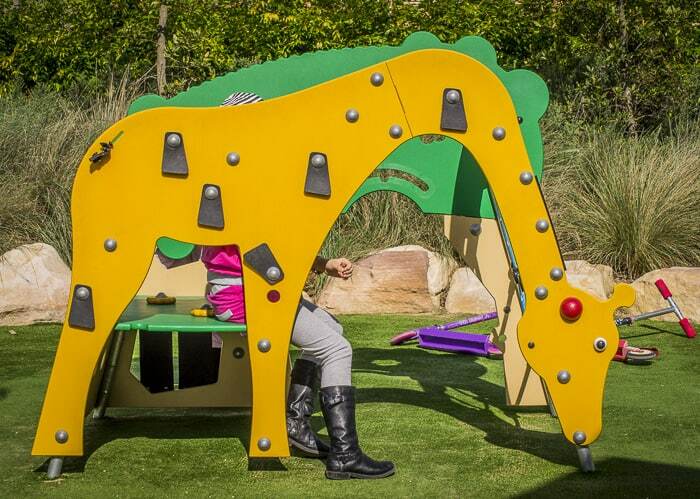 I’ve filed these playgrounds away for when my toddler is a little bit older. Now that’s interesting. I did notice that the kids I took were helping younger children on the roundabouts. I can tell youlife is MUCH easier when you don’t need to always be watching the kids… I can remember loving playgrounds where I could see the whole place all the time, especially with twins. Looks fantastic will definitely take my little one here!!! Good luck with the new job on Monday! I am sure you will ace it! I good amount photos, as they say a picture tells a thousand words. They just showed how great this park looks. I love seeing kids in action in photos. They look so carefree and dimly having fun. Thanks for sharing! Fab photos Seana! You really capture the joy! How I miss having young kids around 😉 What some wonderful places you have to take them in your neck of the woods though. Awesome review. A very rarely get over that way, mostly just stick to parks in the Mosman/balmoral area. But it sounds like a must visit! I do have toddlers though so might be best to leave it until they’re a bit older – they’re definitely not the placid type of toddler that’ll let you take your eye off them for more than 10 seconds. I would like to have my granddaughter’s first birthday party at Livvi’s Place on 1st November. I would like to know if there is a rotunda or similar shelter that I can hire on the day. Hello, I have a feeling there is. But you’d need to check with the council. I’m pretty sure that it’s Ryde Council. Check their website or call up the office and hopefully customer service can sort it out for you. Nice spot for a party. Hello Dalida, I’m not sure if you have to book or not. 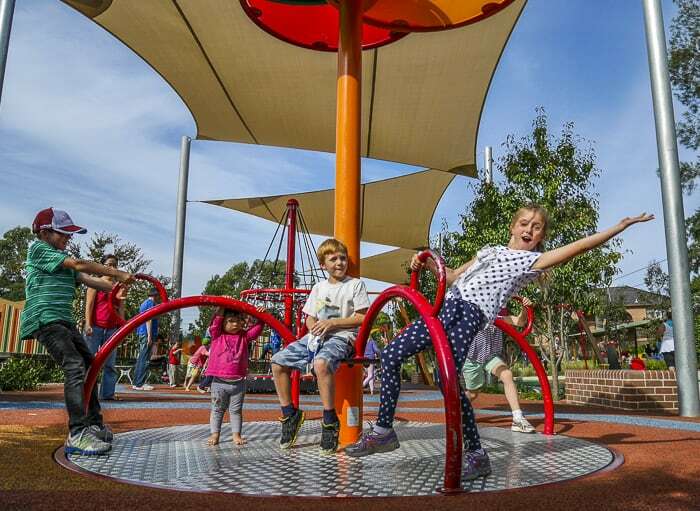 But I think Ryde Council looks after this playground and if you call their customer service department, someone should be able to help you. I did call but they said I have to pay 650$ to book it are they for real ! Wow!! That is SO expensive!! That sounds like a really wise idea! !